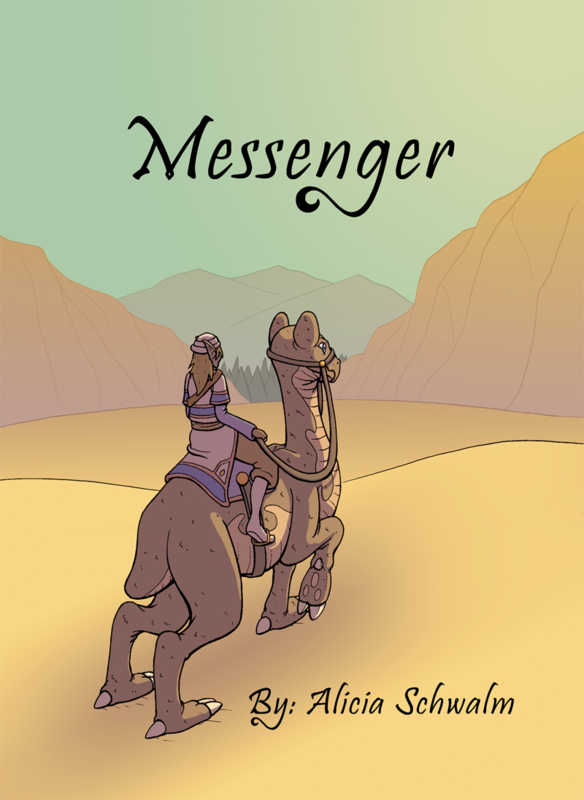 A fantasy adventure following a young messenger and a stern guard on their quest for peace. Teaser 1 Teaser 2 Chapter 1: Cover Chapter 1: Page 1 Chapter 1: Page 2 Chapter 1: Page 3 Chapter 1: Page 4 Chapter 1: Page 5 Chapter 1: Page 6 Chapter 1: Page 7 Chapter 1: Page 8 Chapter 1: Page 9 Halloween 2013 Chapter 1: Page 10 Chapter 1: Page 11 Chapter 1: Page 12 Chapter 1: Page 13 Chapter 1: Page 14 Chapter 1: Page 15 Chapter 1: Page 16 Chapter 1: Page 17 Chapter 1: Page 18 Chapter 1: Page 19 Chapter 1: Page 20 Chapter 1: Page 21 Chapter 1 Character Line-Up Zaki's Turn-Around Little Zaki Asad's Turn-Around Little Asad Emil's Turn-Around Little Emil Cheveyo's Turn-Around Little Cheveyo Kangee's Turn-Around Little Kangee Anatomy of Adel Little Adel Messenger is set to return Anatomy of Nagi Little Nagi Anatomy of Bidziil Little Bidziil Anatomy of Ifalgeolf Little Ifalgeolf My Process (part 1) My Process (part 2) My Process (part 3) Illustration 1 Illustration 2 Inking test Inking Process Chapter 1: Page 22 Chapter 1: Page 23 Chapter 1: Page 24 Chapter 1: Page 25 Chapter 1: Page 26 Happy Birthday, Messenger! Chapter 1: Page 27 Chapter 1: Page 28 Chapter 1: Page 29 Chapter 1: Page 30 Chapter 1: Page 31 Chapter 1: Page 32 Chapter 1: Page 33 Chapter 1: Page 34 Halloween 2014 Chapter 1: Page 35 Chapter 1: Page 36 Chapter 1: Page 37 Chapter 1: Page 38 Chapter 1: Page 39 Chapter 1: Page 40 The Big Fish Story Page 1 The Big Fish Story Page 2 Chapter 2 Character Silhouettes Creatures Concepts 1 Creatures Concepts 2 Zaki Answers Asad Answers Cheveyo Answers Emil Answers Kangee Answers Chapter 2: Cover Chapter 2: Page 1 Chapter 2: Page 2 Chapter 2: Page 3 Chapter 2: Page 4 Chapter 2: Page 5 Chapter 2: Page 6 Chapter 2: Page 7 Chapter 2: Page 8 Chapter 2: Page 9 Chapter 2: Page 10 Chapter 2: Page 11 Chapter 2: Page 12 Chapter 2: Page 13 Chapter 2: Page 14 Chapter 2: Page 15 Chapter 2: Page 16 Chapter 2: Page 17 Chapter 2: Page 18 Chapter 2: Page 19 Chapter 2's Characters Young Asad Turn-Around Young Emil Turn-Around Basira Turn-Around Nadira Turn-Around King Amir Turn-Around Chapter 2: Page 20 Chapter 2: Page 21 Chapter 2: Page 22 Second Anniversary Chapter 2: Page 23 Chapter 2: Page 24 Chapter 2: Page 25 Chapter 2: Page 26 Chapter 2: Page 27 Chapter 2: Page 28 Chapter 2: Page 29 Chapter 2: Page 30 Halloween 2015! Chapter 2: Page 31 Chapter 2: Page 32 Chapter 2: Page 33 Chapter 2: Page 34 Chapter 2: Page 35 Chapter 2: Page 36 Chapter 2: Page 37 Chapter 2: Page 38 Chapter 2: Page 39 Chapter 2: Page 40 Chapter 2: Page 41 Chapter 2: Page 42 Chapter 2: Page 43 Chapter 2: Page 44 Chapter 2: Page 45 Chapter 2: Page 46 Little Young Emil Young Emil Designs Little Young Asad Young Asad Designs Little Amir Amir Designs Little Basira Basira Designs Little Nadira Nadira Designs Adel 2 Nagi 2 Bidziil 2 Basira Convention Sketch Zaki Drawings Style Busts Asad Character Sheet Amir Character Sheet King Amir Chapter 3 Character Silhouettes Baby and Mother Zaki and Adel Emil and Amir Cheveyo and Bidziil Chapter 3: Cover Page Chapter 3: Page 1 Chapter 3: Page 2 Chapter 3: Page 3 Third Anniversary Chapter 3: Page 4 Chapter 3: Page 5 Chapter 3: Page 6 Chapter 3: Page 7 Chapter 3: Page 8 Chapter 3: Page 9 Chapter 3: Page 10 Chapter 3: Page 11 Halloween 2016 Chapter 3: Page 12 Chapter 3: Page 13 Chapter 3: Page 14 Chapter 3: Page 15 Chapter 3: Page 16 Chapter 3: Page 17 Chapter 3: Page 18 Chapter 3: Page 19 Chapter 3: Page 20 Chapter 3: Page 21 Chapter 3: Page 22 Chapter 3: Page 23 Chapter 3: Page 24 Chapter 3: Page 25 Chapter 3: Page 26 Chapter 3: Page 27 Chapter 3: Page 28 Chapter 3: Page 29 Chapter 3: Page 30 Chapter 3: Page 31 Chapter 3's Characters Faiza Turn-Around Little Faiza Faiza Designs Taregan Turn-Around Little Taregan Taregan Designs Chapter 3: Page 32 Chapter 3: Page 33 Chapter 3: Page 34 Chapter 3: Page 35 Chapter 3: Page 36 Chapter 3: Page 37 Chapter 3: Page 38 Chapter 3: Page 39 Chapter 3: Page 40 Chapter 3: Page 41 Chapter 3: Page 42 Chapter 3: Page 43 Chapter 3: Page 44 Chapter 3: Page 45 Chapter 3: Page 46 Chapter 3: Page 47 Chapter 3: Page 48 Anniversary 4 Chapter 3: Page 49 Chapter 3: Page 50 Chapter 3: Page 51 Chapter 3: Page 52 Chapter 3: Page 53 Chapter 3: Page 54 Chapter 3: Page 55 Chapter 3: Page 56 Chapter 3: Pages 57 and 58 Chapter 3: Page 59 News The book is printed! Greetings everyone! I hope you are all getting excited for this! Regular updates will begin in two weeks on Monday, September 2! The comic wrapped up Oct 31, 2017. Please enjoy the comic in full. Beaut artwork there. Look forward to reading in a few weeks.